Today was the day after the UK general election. Regardless of one's own political stripe it was a remarkable morning, difficult to take in and process: expectation confounded, assumptions swept aside. All the release of the prior five week's pressured campaigning was as shocking as it was a relief. 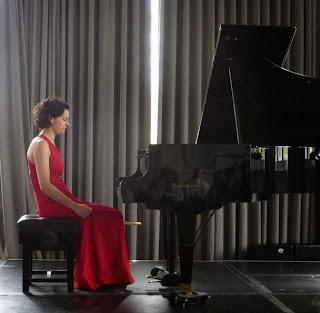 I was glad of an opportunity to get out to Blackheath Halls to hear the American pianist Anyssa Neumann give a psyche-rinsing recital of Bach for keyboard. It was also a good opportunity to experience a concert in the recital room. Recently refurbished, it's a clean, pale shoebox to seat around 100 with decorous Farrow & Ball-like curtains and stained glass cresting the sizeable windows. Anyssa played the French Suite No.1 BWV 812, Two-part Inventions Nos. 14, 6 & 4 BWVs 785, 775, 777 and the English Suite No. 5 BWV 810. There is an unobfuscated finesse to her execution, picking out voice-leading not with spotlighting but with focus. The measured rhetorical opening of the French Suite invited attention to the lines: no teasing Gallic filigree here but the assurance of a well-lit path. I heard the Sarabande through the prism of the dizzying political change of the morning as a sober but stoic argument, the campaign post-mortem if you like. Though the closing Gigue recalled the political frenzy with destabilising, impulsive flourishes it was held in check by the newly-established sobriety in the bass (these were my own metaphorical images, of course, but the consistency of this narrative reflects the integrity of the performance as a suite). In fact the lower voicing of Anyssa's performance was a tremendous feature of this recital. One might also credit the instrument and the room. The sound in the space is clear and alive but without any superfluous reverberance. I loved the sound of the piano, especially in the lower register, with copper-vessel tone that lent a slightly different character to the sound of rising scales, like a proper baritone singing back up into the middle of the counterpoint. There is no information about the Bösendorfer on the Blackheath Halls website (perhaps the Semi Concert Grand Model 225 with sub-contra notes blacked out at the lower octave) but it's an instrument to cherish. So I encountered this recital as a grand displacement metaphor. That's OK, I think - the clarity of the sketching out of the music on the piano allowed me to untangle my thoughts and iron them out. The rest of the audience was local, appreciative and as actively silent as the acoustic: a nice, natural consensus in music on a day when consensus elsewhere might have seemed rather awkward.